Former Secretary of State John Kerry speaks at the Institute of Politics' JFK Jr. forum. Former Secretary of State John F. Kerry offered sharp criticism of President Donald Trump’s policies on climate change and diplomacy during his Tuesday visit to the John F. Kennedy Jr. Forum — while also hinting at a possible campaign for president in 2020. Kerry was joined by four Institute of Politics fellows — former CEO of the Democratic National Committee Amy Dacey, former Nevada congressman Joseph J. Heck, Bloomberg News’ senior White House correspondent Margaret Talev, and vice president of national community alliances and engagement at Teach for America Brittany Packnett — in a conversation moderated by IOP director Mark D. Gearan ’78. Kerry emphasized at the beginning of the talk that it was a “privilege” to be with Gearan, the fellows, and the crowded forum packed with over 200 attendees. Kerry expanded upon his activist background as he discussed his involvement with the founding of Earth Day in 1970 and said current political “troubles” — including the “hostile takeover of the Republican Party by Donald Trump”— have energized him. “I feel as invigorated and energized as anytime in my life because of what it is happening and what is not happening in our country,” Kerry said. 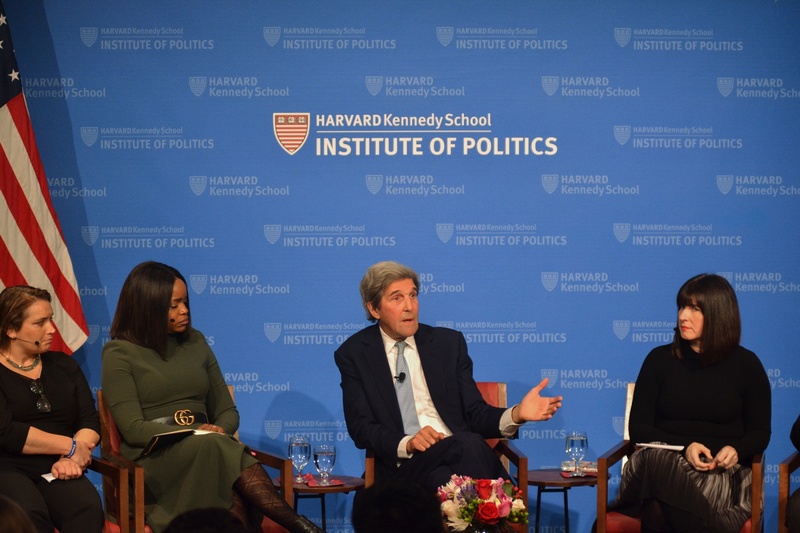 This is not the first time Kerry has visited Harvard. As the keynote speaker for the Kennedy School commencement in 2017, Kerry urged graduate students to approach their careers with optimism and action. On this recent visit, however, he largely focused on the inaction he said was happening on both sides of the aisle. Kerry criticized the current administration for its controversial foreign policy decisions, such as pulling out of the Paris Climate Agreement and attacking NATO. “I believe if there were strong leadership that was active over half of the world and our country at the same time, we would be fighting to hold Europe together more than this instead of attacking NATO,” Kerry said. Kerry was pessimistic about the negative implications of political inaction surrounding climate change — an issue he said could be fixed by working energy policy. He said any decisions the president makes can “cost American lives” and “billions of dollars of property damage” — and the failure to make a decision could be deadly. “We are currently living out, by omission or commission, a mutual suicide pact,” Kerry said. Kerry also faced scrutiny from a member of the audience and Packnett when he described the current state of immigration in the United States and Europe — a factor that he said transformed the politics of these regions. Asked by Talev about his future aspirations, Kerry said he was “thinking” about the possibility of throwing his hat into the presidential race in 2020, but he would not commit to a definitive answer. In recent months, Kerry has consistently declined to rule out a second bid for the presidency. In 2004, he lost by a slim margin to President George W. Bush. “I’m not going to take anything off the table. I haven't been running around to the most obvious states, laying out the groundwork,” Kerry said. BOSTON THEATRE. - "The Black Hussar." 7.45. HOLLIS ST. THEATRE. - "The Mikado." 7.45. PARK THEATRE. - "The Ivy Leaf."